Captain Katanga was the captain of the Bantu Wind, a cargo ship that helped Indiana Jones board a Nazi submarine in order to rescue his girlfriend, Marion Ravenwood and retrieve the Ark of the Covenant. He has a tan sweater and a white sailor's cap. 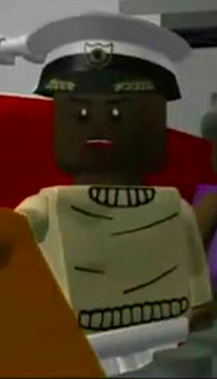 Katanga appears in the movie, Raiders of the Lost Ark as well as in the video games, LEGO Indiana Jones: The Original Adventures and LEGO Indiana Jones 2: The Adventure Continues. In both games, he carries a wrench and can fix blue generators (And other objects alike). He was portrayed by George Harris, who also played Kingsley Shacklebolt.